I started off this book with good intentions. I had chicken and needed a recipe that was just chicken. As the book went on and on I tried to find out where the actual recipes were only to find page after page talking about the Foodi. Great! But I wanted a recipe. Finally I find the chicken section and pick Orange Chicken....I get the rice going in the pressure cooker while I dice up chicken and get the sauce ready. Rice done! Now this is where the recipe didn't work. It said to put the adjustable rack up, spay it with non-stick and put the chicken brushed with olive oil on it...with the rice still under it. So I did this and after 10 minutes the rice was a rice cake patty and the chicken very unappetizing. Needless to say, I changed it all up and saved the meal, but not because of a good recipe. Luckily I got it with my Kindle Unlimited subscription because it wasn't worth the money. Onward looking for a good recipe. 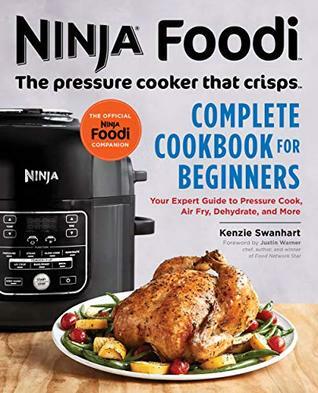 Sign into Goodreads to see if any of your friends have read Ninja Foodi.